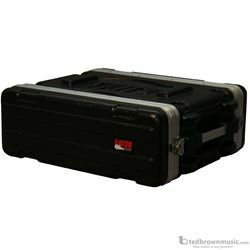 Molded PE Rack Case; Front, Rear Rails; 3U; 14.25" Deep. Lightweight polyethylene construction with front and rear rails and heavy-duty twist latches. Threaded field replaceable 7mm zinc plated steel rack rails and comfortable recessed side handles. Compact 14.25" rack depth.